NOTE: This is a two-part review, I will be reviewing both Reflector as well as Reflector Director for iOS. The reason being is that Reflector Director does not work without Reflector so reviewing both applications makes a more complete review. Also, I will only be reviewing the Mac version of Reflector. While Reflector does offer a Windows app, I am a Mac user and do not own a Windows computer nor do I have Windows installed on my Mac via Bootcamp. Have you ever wanted to mirror your iPad or iPhone to your Mac? Do not own a Mac? What about to your Windows computer then? How about to an Amazon fireTV? If you have answered yes to any of those above then Reflector 2 is the application you are looking for. 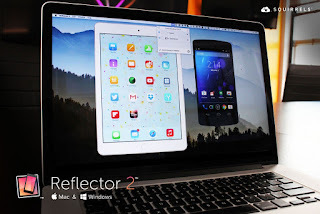 Reflector is a powerful screen-capturing, device mirroring application available for both the Mac and Windows. It only cost $14.99, but if you are not sure if it is right for you there is a 7-day free trial! What is mirroring good for? Streaming movies or videos to your device that doesn’t support AirPlay for one. Your Mac supports AirPlay but it doesn’t support inbound AirPlay connections, with Reflector running on your Mac it now does support inbound AirPlay, and it works flawlessly! Play an iPad/iPhone game on your huge 27” iMac screen, with Reflector now you can. Just to name a few ways I find mirroring my iPad to my iMac to be extremely useful. 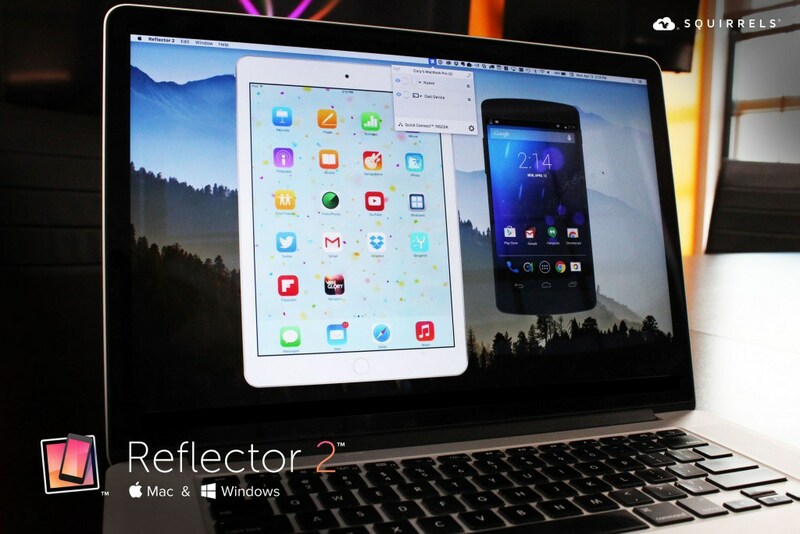 With Reflector 2 you now have the option to physically record your screen mirrors. There is no need for other 3rd party applications to record as you can do so all within the Reflector application. There are a plethora of options for recording as well, you can choose to show the desktop if you like or you can add a curtain to your desktop and choose a colored background instead. You do have the option to choose which color you would like to show on the background as well. You have several recording options, those options range from 4K, 1080p, 720p, and all the way down to 420p depending on your recording needs. Not only can you choose the recording resolution you also have the ability to adjust the Frames Per Second or FPS. You can adjust the FPS settings from 15 FPS up to 60 FPS. Additionally you can choose video quality also, from High Quality to Low Quality, again depending on your recording needs. For more of the settings of Reflector be sure to check out my video preview of Reflector and Reflector Director. How do I use Reflector? I started using Reflector several years ago, I believe around end of 2012, maybe early 2013. I can’t quite remember when it launched but I know I was there in the beginning of it being able to be mirrored to my Mac. I know AirPlay came out in 2010 and I believe mirroring was added later, around June of 2011. I started doing video reviews of iPad apps for this very site and I have not looked back yet. Of course I was using Reflector 1 and now I am using Reflector 2, I will get into the differences in a bit. One thing I will say as someone who has used Reflector for several years now, I have never had a single issue and the application has worked flawlessly! Matter of fact I would say without Reflector I probably would not have kept up with this site. I love doing the video-casts and/or app previews and Reflector enables me to do them and has enabled me to do them since the early days. Matter of fact, I have been using Reflector since it was called Reflection, here is a barely watched YouTube video I uploaded in January 2013. I would say Reflector has played a huge part in both my desire to do app reviews as well as continuing to write about applications on the iPad. I find that including a video review of the application I am reviewing to not only be more rewarding to the reader but also more enjoyable for myself. I write about these applications as a hobby, I am not paid to write them, I only do so because I enjoy talking about the iPad and the apps I use. Adding video demonstrations to these reviews also allows those that don’t care to read what I write instead watch the video review. Also, I have a much larger audience on Google+ and YouTube than I do that visit this site. That means my videos reach a much larger audience. Reflector allows me to do the video reviews than I want while allowing me to share my hobby with others around the world. I also use Reflector to record some of my iPad gameplay. I recently started playing a game called Empires & Allies. I have been using Reflector to share strategies with my alliance members. I also started uploading a few of these videos to YouTube to share with others who are playing the game. I have been sharing some of my strategies for both offense and defense as well as how I setup my base defenses and how to achieve certain task in the game. So if you have dreams of becoming the next YouTube Let's Play millionaire then you will want to purchase Reflection to get started with creating awesome game highlights. Reflector also offers a in-app security options such as on-screen AirPlay codes so that you must enter a 4-digit code on your Mac before another device can connect to your machine. You also have the option to allow or deny a device before it connects to your machine. There is another feature called Quick Connect that is a 6-digit code that is used for AirParrot, again keeping your devices only connected with your devices. While I have never personally run into a situation where I have had others trying to connect to my machines. I assume these would be helpful in situations like living in an apartment complex or using Reflector in an office building. YouTube Streaming and Webcam Video are both coming soon. Stream device screens directly to YouTube in real time. Invite others to watch your screen from anywhere in the world. Add webcam video to recordings for a personal touch and feel. Director is an iOS only application that works on both the iPad and iPhone. Director allows you to manage devices that you have connected to the Reflector app running on your Mac and choose which devices you want to record while allowing you to hide the other devices. There are plenty of customization options as well, choose between a white or black iOS device face. Choose between gold, space gray, or silver colored device. You can also choose between devices from iPhone 5, 5s, 5c, 6, 6 Plus, iPod, iPad and iPad mini all depending on which device you have connected to Reflector. The iPod and iPhone 5c also allow you to choose from the colors those devices come in such as pink, yellow, green, coral, and more. In addition you can also choose to show or hide the frame of the device if you just want to mirror the screen but not actually show which device you are using. There is also an option to scale your device to stretch to fit on the screen, the actual size, or best for Retina. There are orientation settings for automatic, forced landscape and forced portrait. Lastly, you have the option to start or stop recoding right within the Director application. The great thing about Director is you can also manage non-iOS devices such as an Android tablet or phone that is connected via Google Cast to your Mac. Even better you have the ability to connect multiple devices to Reflector and then manage them all within Reflector Director on your iPad or iPhone. This is great if you want to preview what is on the screen of a device before you actually bring it front and center while you are recording. A lot of times I will review applications and want to show both iPad and iPhone versions, this is a great way to do that without having both devices on the screen at the same time. While I don’t do many Android reviews, if I ever wanted to review an app that has both an iOS and Android version this would be a great way to manage all those devices and gives me the ability to enhance my presentations professional look. I have tried doing side-by-side app comparisons before and it wasn’t the best experience, of course I wasn’t using Reflector 2 then because it didn’t exist yet. Reflector 2 solves these issues that I previously had and managing them within Reflector Director is a cinch. If you are using AirParrot you can also send your device or screen to any AirParrot enabled machine. I don’t use AirParrot nor have I ever used it so I can’t give an opinion of how the service works. I do know that it allows you to share more than just your screen, you can also share files such as video, audio, and documents. I do not have a single negative comment to make about Reflector, as someone who has personally used this product for about 3 years I highly recommended it. If you are still unsure about buying Reflector then consider downloading the free 7-day trial and testing it out to see how flawlessly it works. In my opinion it is the absolute best way to mirror your device, no matter if it you are using an iPad, iPhone or Android device to a Mac. For more information about Reflector please visit the the developers website: http://www.airsquirrels.com/reflector/. UPDATE: Here is Android using Reflector on my Mac.